part·ner·ship (pärtnr-shp) Noun. – The state of being a partner. A relationship between individuals or groups that is characterized by mutual cooperation and responsibility. Partners work together to form an alliance, to increase the likelihood of each achieving their mission and to amplify their reach. So who is a PAX Partner? YOU ARE. Each one of our clients are partners. As a partner you are entitled to more than just a financial advisor, you receive an educator, an information resource, a trusted confidante, a partner. 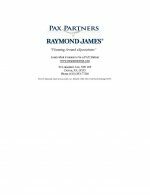 This includes solutions for a full range of financial circumstances and sharing in the charitable initiatives that PAX sponsors.The spirit of partnership that guides our practice existed long before we formally became PAX Partners of Raymond James & Associates in November 2007. For more than 35 years, we’ve been building the close relationships that lead to truly insightful financial plans. For our founder, Drew Bilotta, financial planning has always been about much more than numbers. When he first joined the industry in 1983, he quickly recognized the importance of strong relationships to successful investment plans. See what PAX In Action means. It was apparent that investors needed more than just a financial advisor. So, he committed himself to being a financial partner to his clients, and a job became a career. 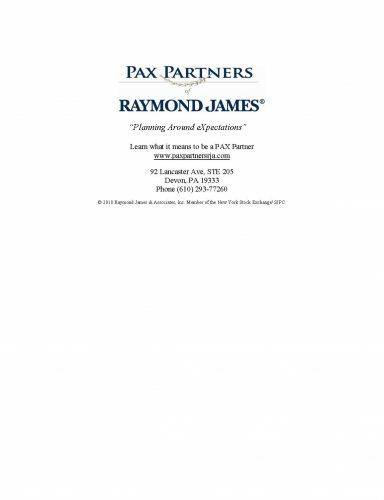 And that career has come to fruition with the establishment of PAX Partners, where we focus on forming lasting partnerships in order to provide the comprehensive, in-depth analysis that leads to unique and creative solutions for a full range of financial circumstances. We also strive to serve the needs of the community we all share through our charitable initiative, PAX Makes a Difference.